Since 1996, Jean Ortega-Piron ’81 has served as Guardian/Deputy Director for the Illinois Department of Children and Family Services (DCFS). An active Chicago-Kent volunteer, Jeanie has been a mentor for the Society of Women in Law for several years, and received the Chicago-Kent Professional Achievement Award in 2007. Her practice areas include juvenile, probate, mental health and special education. This Wednesday, October 3, retired U.S. Supreme Court Justice John Paul Stevens will visit the law school for a lecture titled The Ninth Vote in the "Stop the Beach" Case. A live webcast of the lecture will be available at www.alumni.kentlaw.edu/justicestevens beginning at 1:30 p.m. I hope you will tune in for this tremendous occasion. Later this month, Chicago-Kent will welcome 16 of the nation’s best trial advocacy teams (including our own) to Chicago for the 2012 Tournament of Champions. As the 2010 champions, the National Institute for Trial Advocacy selected Chicago-Kent to host this prestigious competition. Competition rounds will take place October 25-28 at the Richard J. Daley Center, with the final rounds here at Chicago-Kent in the Marovitz Courtroom, as well as in a second courtroom that we are currently building on the first floor, which will include the latest in courtroom technology. We simply ran out of space for our trial and appellate advocacy teams to practice and compete. For more information and naming opportunities, see www.alumni.kentlaw.edu/courtroomrenovation. The Tournament of Champions is a tremendous opportunity to showcase our outstanding appellate advocacy programs and the students who make them so successful. Overall, Chicago-Kent has been invited to compete in the tournament for the past six consecutive years and eleven times overall. There are several opportunities for alumni to be involved as evaluators throughout the tournament. For more information, visit www.alumni.kentlaw.edu/toc. Many thanks to our competition sponsors, including so far: SmithAmundsen, Anesi Ozmon Rodin Novak & Kohen, Ltd., and McDermott Will & Emery. Many thanks to all of our alumni who have volunteered for Alumni/Student ConneKtions (ASCK) Week and our Society of Women in Law mentor program. We appreciate all of our alumni volunteers and their efforts to create a strong and active Chicago-Kent community. 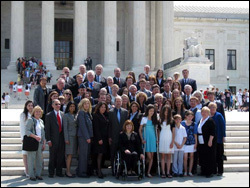 U.S. Supreme Court Group Swearing-In in May 2011. The Chicago-Kent Alumni Association will host a group swearing-in at the Bar of the U.S. Supreme Court on Monday, March 4, 2013. If you are interested in participating, please fill out the Information Form by Monday, December 3, 2012 to reserve your spot. Our group is limited to 50 participants. Please see www.alumni.kentlaw.edu/supremecourt for additional information. Bernadett Guy ’13, Tara Korthals ’13, Erin Mayer ’13 and Valerie Raedy ’14 will represent Chicago-Kent in the 2012 NITA Tournament of Champions, hosted by Chicago-Kent October 25-28. Alumni coaches for the team include Nicholas Caputo '01, Nikitas Fudukos '09, Joshua Jones ’08, Jeremiah Lewellen ’11, Anthony Lucafo '07, and Alexandra Molesky '07. Alumni volunteers are needed to serve as evaluators;for more information, please visit www.alumni.kentlaw.edu/toc. The Loan Repayment Assistance Program (LRAP) at Chicago-Kent assists alumni in low-paying public interest jobs in managing student loan debt so they can remain in those jobs, and to encourage current students to consider a public interest career. Applications will be accepted until December 1 from eligible alumni, with awards granted in February 2013. For more information on the LRAP, visit www.kentlaw.iit.edu/lrap. Chicago-Kent’s Center for Information, Society and Policy presents “Under Watchful Eyes: The Technologies That Track,” a free, one-day conference on Friday, October 5, bringing together a wide range of experts in technology, legal, computer science, and information privacy fields to discuss privacy issues created by the ever-increasing use of geo-location data. To register or for more information, please visit www.kentlaw.edu/cisp. The conference is eligible for 5.0 hours of IL MCLE credit. Each year, the Chicago-Kent Alumni Association and the Alumni Board of Directors invite individuals and firms to sponsor the Alumni Awards & Recognition Luncheon taking place Thursday, November 15. The luncheon benefits the Chicago-Kent Alumni Board Scholarship, awarded annually to students who display school involvement, financial need and academic merit. For more information on the Luncheon, visit www.alumni.kentlaw.edu/awardsluncheon. See www.alumni.kentlaw.edu/asck for more information. Wednesday, October 10, 2012 | 5:30-7:30 p.m.
RSVP to alums@kentlaw.iit.edu or (312) 906-5240 by Tuesday, October 16. Eligible for 5.0 hours of IL MCLE Credit. "How It Broke, How to Fix It: The Crisis of Israeli Democracy and What To Do About It"
Tuesday, October 16, 2012 | 4:00 p.m.
Friday, October 19, 2012 | 8:00 a.m.-5:30 p.m.
Tuesday, November 6, 2012 | Noon-1:00 p.m.
Friday, November 9, 2012 | 8:15 a.m.-4:45 p.m. Alumni from the classes of 1962 and prior gathered at the law school fo a luncheon to celebrate 50+ years since their graduation. Click here to view a slideshow on Flickr. 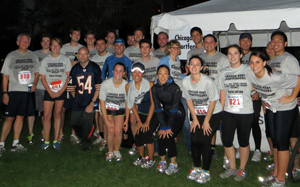 Runners pose for a quick photo in front of the Chicago-Kent Sportfeasors tent at Race Judicata. 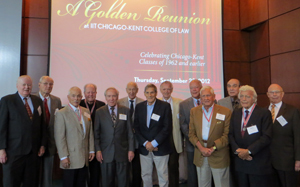 Representatives from the classes of 1950, 1957, 1958, 1959, 1960, 1961, and 1962 attended their Golden Reunion Luncheon. 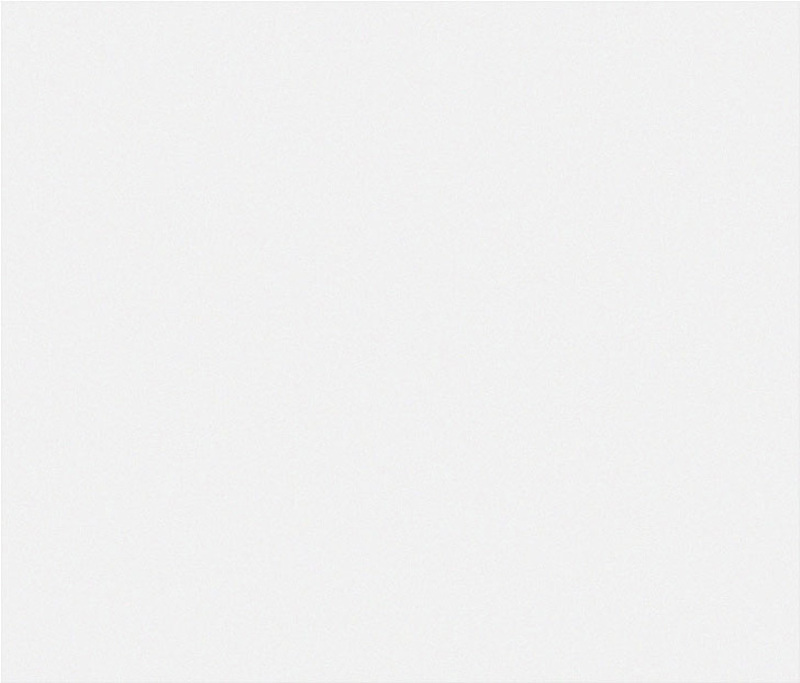 such as practice trends, legal markets in specific geographic areas, and other related topics.